The run-up to your marriage can be a frenzied, hectic affair. Money matters take precedence when it comes to finalising the wedding location, the caterer, the guest list and so on. However, money matters of another ilk fall through the cracks during such tumble-dry phase. It is very easy to forget, amid the hullabaloo, the importance of understanding each other’s life goals and financial habits. After all, you would be sharing most of the daily activities together for the rest of your life. So, before you walk down the aisle, here are some financial investment tips for beginners. Effective communication is the key to any successful marriage. Yet, more than often, most couples hesitate to discuss money matters. However, it is best that you and your spouse understand each other’s money habits, past and current debts, investments and savings. Assess your financial health and share it with your better half. If you find it awkward, begin with small talks. Make it a casual discussion. Get into the details as you begin to get comfortable with each other. After the wedding, you and your partner would take combined decisions for all things under the sun. Start with deciding on how the both of you would manage your monthly finances. Think whether it would be better to have a joint account. It is also important to divide your monthly expenses. Also, thinkhow to take care of investments and savings.This would enable you to run your house effectively. Never underestimate the importance and urgency of updated documents. Updating your marital status and/or new name in your PAN card, Aadhaar card, passport, bank accounts, insurance and investments should be top-priority on your post-marriage to-do list. Are you planning to stay in a rented house or your own house? Do you need to setup a fully-functional house? Would you be looking at buying a new apartment? What will be the change in premium to get your spouse added to your insurance policy? Would it be easier to commute by public transport from your new home? Or do you need a personal vehicle? Do you need a motor loan? 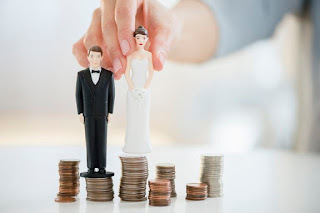 Having some idea of post-marriage expenses can allow you to plan your finances accordingly. Having a contingency fund is not the only way to be ready for an emergency. With a partner adding to your life, your contingency fund should increase. Besides, it is important that you have some short-term easy-to-liquidate investments like fixed deposit, corporate deposits, bonds etc. After your wedding, it is the life of two that you need to protect and secure. As you begin a new life together, your responsibilities will increase as well. To fulfil these responsibilities, you would need sufficient funds at the right time. Mere savings will not help you build enough wealth to meet your goals. Hence, you must also invest according to your goals. It could be buying a car/house in three years, your child’s education and retirement. A planned investment portfolio, with the right mix of equity and debt, can help meet all your future goals as a couple. A well-laid financial plan serves as a road map for your future. Make sure you both devote enough time before and after marriage to make and review your plan. If something doesn’t seem going the right way, change the route. Sometimes, a detour may seem time-consuming but is a better way of reaching your goal. Use these tips to get into the skin of the new role you are about to take up. A happily ever after is not a myth, but it involves efforts, communication and some strategic thinking from both partners.If you aren’t well-versed in the world of finance, it is best to start with mutual funds. There are fund managers who can help invest your money in the right places.